Protect your vacation home or office while you're away with a customizable monitoring system from Sensaphone. By buying this product you'll earn up to 374 Rewards points. Protect your vacation home or office while you're away with a customizable monitoring system from Sensaphone. The Model 400 easily mounts on a wall or counter, and its built-in detectors monitor for temperature changes, power failure, and loud noises like a smoke alarm siren. If any detectors are triggered, the system calls you on the phone to notify you of potential problems. This unit also features three open ports to connect additional detectors using 22-gauge accessory wire (not included). Choose a remote temperature sensor or window/door sensor to give your system more complete coverage. Water monitors allow you to detect water in areas that are prone to flooding. Temperature and humidity detectors alert you to changes in the condition of your garage, storage space or greenhouse. Use Sensaphone to monitor areas where you keep family possessions or exotic plants. The Model 400 connects to a phone line, and it contacts you with customized voice messages you can create for each type of detector in your system. Program the Model 400 with up to four different telephone numbers — it'll call each one until someone answers. For example, if the heater in your vacation home stops working and the temperature drops, the Model 400 will call you at home, at the office, and on your cell until you pick up. That way, you'll be able to schedule repairs from out of town. This is my second Sensaphone. It is an excellent monitor. I received fast delivery service and good pricing. Can this model support at least 3 different temperature probes? 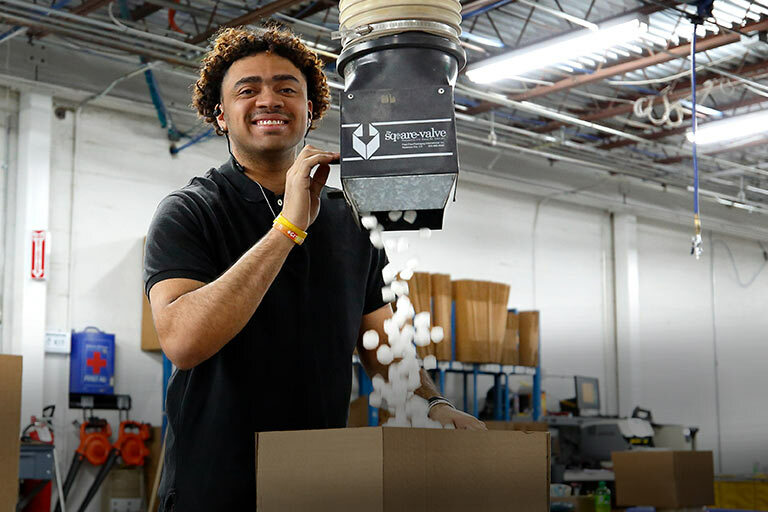 Overview: The Sensaphone Model 400 is a full-programmable, environmental monitoring system that offers extensive on-site and remote monitoring capability to small businesses, private homes, farms, greenhouse, computer rooms, and remote facilities. Designed for desktop or wall mounting, the Model 400 is simple to install, program and operate; no changes to standard electrical or telephone service are required. When connected to a telephone line, it will respond to an alarm by dialing up to four separate telephone numbers. When the call is answered, an "Alert Condition" message is delivered in the user recorded voice. Built-In Sensors: The Model 400 features built-in sensors to monitor a variety of conditions - High sound level, AC electrical power failure, and Battery backup conditions. In addition to the 400's built-in ability to monitor for power failures and to listen to the sound of a smoke detector, there are also four external inputs that can be connected to a variety of sensors to monitor temperature, water on the floor, humidity, and much more. One of the four external inputs already comes with a temperature sensor for monitoring temperature where the 400 is installed. 4 Alert Zones: The 400 is equipped with four alert zone connections. 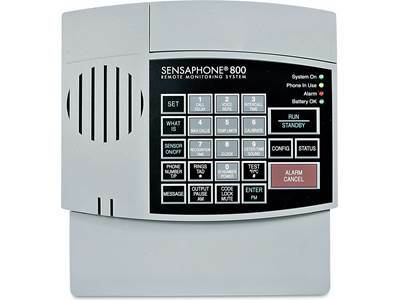 Optional Sensaphone sensors can be added to extend monitoring capabilities to include the following - Intrusion or unauthorized entry, Water leaks and seepage, Temperature, Humidity, Equipment operation, and many other condition that may require unique monitoring solutions. These optional sensors can be connected to the 400 using 18-26 gauge wire. Each sensor can be several hundred feet from the unit, as long at the total resistance of the circuit is not greater than 50-ohms. The Model 400 may have more than one sensor connected to the same alert zone either in parallel (Open contacts) or series (Closed contacts). Note: Do not use sensors, switches or relay that supply any voltage or current to the Model 400. Keypad: Programming and operating of the 400 is accomplished by using the unit's keypad. Programming features include Zone Configuration, Temperature Settings, AC Power Settings, and Alarm Settings. Status Reports: In addition to communication and alarm monitoring capabilities, the Model 400 will also respond to your instructions and provide you with access to information on monitored conditions at all times. The status of each monitored condition is readily obtained at the unit's installation site, or remotely by telephone. By issuing commands to the unit, either at the installation site or over standard telephone lines, the following features may be activated - Acknowledgment of existing alarms, The Status Report on all monitored conditions, and Limited programming. At the close of every Status Report, time is provided for listening to on-site sounds. LED Indicators: The LEDs on the unit's front-panel provide on-site alarm and status information. The 400 features four LED indicators - System On, Phone In Use, Alarm, and Battery OK.
Security Code: The Security Code is the last step after setting all other programming parameter for the Model 400. The code consists of a 4-digit number you select and will effectively prevent unauthorized changes to the Model 400's programming. Telephone Connection: The Model 400 features a RJ-11 LINE and EXT connection. Your incoming phone-line plugs into the RJ-11 LINE connection and your telephone plugs into the RJ-11 EXT connection. The 400 will operate with all standard analog telephone lines that accept pulse or tone dialing. The Model 400 cannot be used on an extension line to dial its own telephone number. Also, it may not be installed on a party line, pay telephone line or digital telephone system. Dial-Out Telephone Numbers: The Model 400 can store up to four 48-digit phone numbers. These are the numbers that will be called during alarm dial-out. In the event of an alarm, the numbers are dialed sequentially, 1 though 4. The Model 400 can be set to cycle through your four dial-out numbers from 1 to 255 calls (15 calls if only one telephone number is programmed) during an Alarm Dial-Out. Alarm Dial-Out: When an alarm is detected, the Sensaphone 400 can notify up to four people by making voice phone calls. It will continue to make phone calls until someone responds to the call. The voice messages can be custom recorded, so you get to describe each alarm message that it speaks in your own voice. 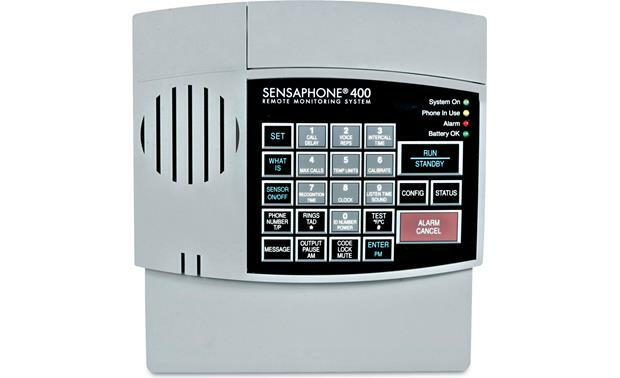 The Sensaphone 400 can also be programmed to send an alarm message to a numeric beeper/pager. The message will include the Sensaphone's telephone number and the Zone numbers that are in alarm. The phone interface includes a line seize feature so that extension phones are automatically disconnected when it needs to make an alarm phone call. Voice Messages: The 400's digital speech recording feature allows you to record custom messages from each of the four Zones and an ID Message. This means that when the 400 calls you during an alarm, you will hear a personalize Voice Message identifying the unit and telling you exactly what alarm condition exists. You can record a separate message for each of the four Zones. The message can run a maximum of 5 seconds. The ID Message can be a maximum of 8 seconds. Built-In Speaker: When the Model 400 dials out to report a alarm, it also audibly recites the alarm message through it's speaker. The Local Voice Mute command allows you to turn off the speaker at the Model 400's site during alarm dial-outs and status call-ins. This feature is used to prevent intruders or unauthorized person from hearing the alarm dial-out message or from hearing the Status Report during an off-site call. Built-In Microphone: The Model 400 is provide with a built-in microphone which is used to monitor high sound levels produced near the installation site. The sensitivity of the microphone is configurable and will detect a continuous as well as a pulsating alarm. If this sound level exists for 8 consecutive seconds or for the programmed length of time, the model 400 will dial out with an alarm message. During an alarm dial-out, the microphone allows four-second intervals to listen-in to sounds at the Model 400's locations. When calling for a Status Report, the microphone permits listening to on-site sounds for a programmed time interval. Output Relay: A built-in output relay is provided to switch an external device either automatically, or manually. You can use it to have a local light or siren trip when an alarm occurs, or even to set off a local alarm when the phone line is cut or unplugged. You can even use it to control a dual setback thermostat to change the temperature remotely. Power Supply With Battery Backup: The Model 400 is provided with a DC power transformer that will plug into any standard 120 VAC outlet and a battery backup (batteries not included) that enable the unit to continue function if AC power is removed. To ensure reliable operation, the Model 400 features power backup capability; in the event of AC power failure, six C-cell alkaline batteries (not included) will continue to power the unit for approximately 24 hours. Do not use rechargeable batteries. Built-In Surge Protection: The Model 400 has built-in surge protection, however, it is recommended that additional protection be obtained for the unit and for any electronic equipment that is attached to your power supply and telephone lines. Built-In Clock: The Model 400 has a built-in clock. If the AC power fails, the clock will continue to keep time until the battery back-up fails. Mounting: The Sensaphone 400 can be either Flat or Wall mounted. The Model 400 can be mounted on top of a desk or other horizontal surface. The 400 can also be wall-mounted via the unit's rear-panel keyhole slots and using the supplied hardware. 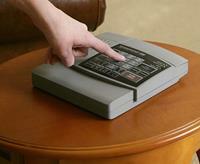 Searches related to the Sensaphone® Model 400 Remote monitoring system for your home or office.